Upper Deck is proud to announce its newest product line of sports figures featuring the incomparable duo: Pro Shots featuring Michael Jordan and Tiger Woods. 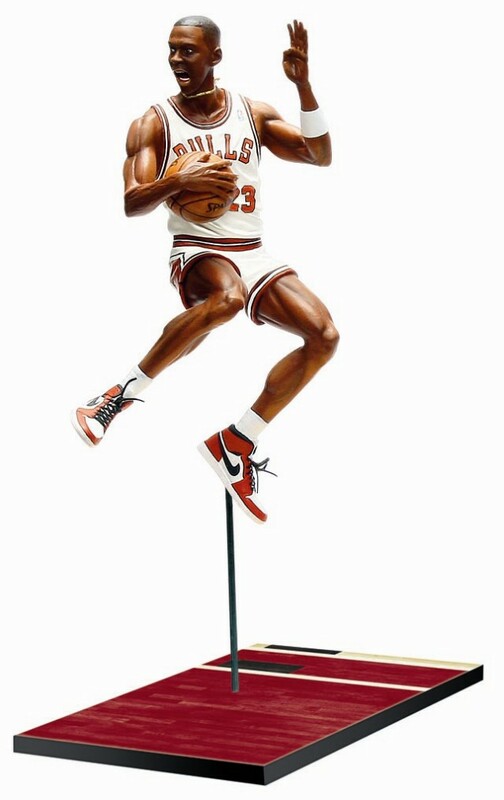 Utilizing 3D-face-scanning technology to create “hyper-realistic” figures, both Jordan and Woods are 6″ and sculpted to celebrate iconic moments from their careers. Each Pro Shots figure comes packaged inside a clear “in the moment” diorama-style display box with an Upper Deck trading card commemorating the moment. The Michael Jordan and Tiger Woods Pro Shots figures are expected to ship this month and will retail for $15.99-19.99. Expect them to hit online shops and any Toys ‘R Us location nationwide. Special variant version of each figure are also expected to hit selected retail stores such as CHAMPS or at www.upperdeckstore.com. Not satisfied with realistically sculpted action figure collectibles? Well Upper Deck has that covered too with their hobby-exclusive, high-end line of these action figures called “Pro Shots Ultimate.” Pro Shots Ultimates feature the same Michael Jordan and Tiger Woods sculpt and design but are “ultimate” versions made out of high-quality polyresin, stand 12″ tall and weight as much as 10 pound apiece. The suggested retail price for each keepsake is $199.99. The Jordan variations are limited to just 2,023 pieces, while the Tiger keepsakes are both limited to 2,000. In the spring, the Pro Shots and Pro Shots Ultimate lines will expand to feature famous moments from Muhammad Ali’s illustrious career.